Knowledge is your company’s primary asset. It comes with experience, its unique to each organization, and most importantly, it provides you an edge over your competitors that no software or money can provide. However, having tons of knowledge and knowing what to do with that knowledge are two different things. Most organizations act as a single unit for the outside world, but are broken down into specialized silos from the inside. This prevents the information and knowledge flow from one department or employee to another, often leading to inefficient and at times disastrous outcomes. A study conducted by McKinsey & Company shows that employees spend 19% of an average work week trying to gather the information needed for completing a task. To add to that, Fortune 500 companies lose roughly $31.5 billion a year by failing to share knowledge. The problems created by not managing knowledge effectively are costing businesses big time. This is where an internal knowledge base comes to the rescue! 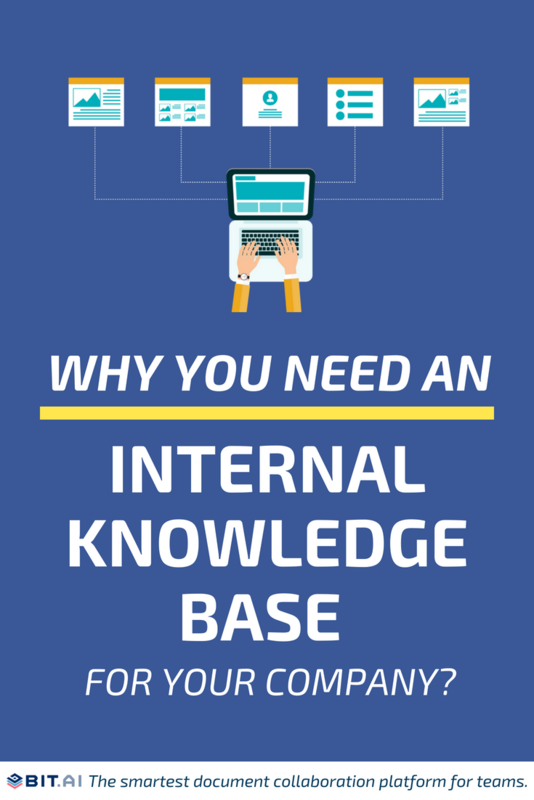 What’s an internal knowledge base? An internal knowledge base is a knowledge base set up by a company that is strictly for internal use. An internal knowledge base is defined as a central repository for managing and distributing all company knowledge and information. It’s a place where all your co-workers can store and find internal documentation about company policies, processes, how-to guides, projects or products they are building, common workflows, shared logins, procedure checklists, FAQs, troubleshooting guides, etc. The data in your internal knowledge base can come from various departments of your organization. Usually, the internal knowledge base is created by people who are well-versed in particular topics and areas of expertise and can range in topics from HR policies, to product specifications, brand guidelines, etc. Customer Service: Storing knowledge about customer FAQs and troubleshooting guides to help customers promptly. IT: Product specifications, how-to guides, training and onboarding documents, etc. Legal: Information about contracts, legal policies, approval guidelines, etc. HR: Information about company policies, company hierarchy, vacation policies, company culture, etc. Marketing: Information about marketing budget, content strategy, PR guidelines, etc. Sales: Sales strategies, sales enablement documents, prospect information, etc. Management: Information about reporting officers, policies, procedures, etc. Design: Company logos, design best practices, recommended color-schemes, design work for inspiration, etc. Why does your company need an internal knowledge base? As a company grows and evolves in this digital world, they often find themselves in a sea of information, data, and procedures that your employees need to know and follow. It thus becomes imperative to have systems in place to better store, manage, and share organizational knowledge with employees, clients, and partners as quickly and accurately a possible. There are many reasons why its crucial for a company to have an internal knowledge base. Improved Internal Communication and Collaboration. Creating an internal knowledge base is not a one-person job. It requires every employee or at least some highly experienced ones from each department to pitch in their know-how and create a pool of knowledge for everybody in the organization to benefit from. It’s important to create and edit information together. This provides an opportunity to improve internal collaboration, transparency, and interdepartmental relationships. Also, making up-to-date changes and providing with relevant information to employees helps everyone be on the same page and get work done efficiently. Have you ever found yourself searching frantically for a customer query while they wait on call? Most of us have and we’ve got to say, it’s terrible. According to reports, a whopping 57% of people had been so frustrated with phone customer service that they hung up the phone without a resolution. Providing prompt answers to customer problems can go a long way in affecting your company bottom line. As much as 75% of people say they spend more with a company who has a history of providing positive customer service. When you have all company information- troubleshooting guides, how-to manuals, FAQs etc. all at one place, service reps are able to provide a faster, better customer experience. If your employees are searching for information or shoulder tapping other employees for help, it takes away from the crucial time they could have spent working. Employee productivity takes a hit when your company lacks an internal knowledge base to refer to. However, when companies use an internal knowledge base to store company knowledge and information, employee productivity can be boosted by as much as 35%! Having a central repository for all your company’s information allows organizations to document the know-how and experience of highly skilled employees so that the knowledge of the organization does not leave when that employee goes on a vacation, falls sick or leaves. It could be quite challenging for new hires to adjust to a new company or industry without having any prior knowledge of the practices, procedures, standards, hierarchy, or technical know-how. This is one of the core reasons why a massive 40% of employees with poor training leave their jobs within the first year. Having an internal knowledge base allows faster employee onboarding as new employees can be directed to a single resource of company information rather than having to find information themselves. What makes a great internal knowledge base? An ideal internal knowledge base should be able to provide a flexible workspace where employees from various departments can collaborate, give feedback, and create organizational resources that are easy to find and understand. At the same time, it should be easy and intuitive enough for anyone in the organization to use and benefit from. An internal knowledge base is only good as its content. The quality of the content can only be good if everybody in the organization can chip in, give their suggestions and feedback, and make sure that the content is accurate and up-to-date. A competent internal knowledge base must allow real-time collaboration. This will give employees the opportunity to work together simultaneously, brainstorm ideas, innovate and solve problems with their collective experience and knowledge. Since an internal knowledge base is where the knowledge of the entire organization’s processes, procedures, policies, etc. is stored, it becomes absolutely necessary for it to have a powerful search feature to locate content quickly. Knowledge is only useful when the right information is made available at the right time. You want to reduce the amount of time your team spends looking for a particular file or document and for that, a powerful search feature is a must. In order to make the most of the powerful search functionality, you must be able to add tags, titles, and descriptions to every piece of digital content that gets stored in your internal knowledge base. Your team needs to be able to categorize and add details to make information easier to search, find and work with. An internal knowledge base should make the process of documentation and content creation, as easy and robust as possible. It’s important that you can share knowledge that isn’t already created but also share current and ongoing knowledge as well. Collaborative documents are a great way to share this collective knowledge. Make sure that the documents allow co-editing and are flexible enough to include various types of digital content. Knowledge can take any form, from your documents, files, presentations, PDFs, Excel sheets, SlideShares, YouTube videos, web links, images, logos, GIFs, audio files or even social media content. It’s important for your team to have all this information in one place. Having a content library allows you to store all of your organization’s media assets at one location, making it easy for employees to store and access key information quickly. Make sure that your internal knowledge base has features like “restricted access” or content control so that only people with access can view and share those digital assets. The goal of an internal knowledge base is to allow sharing of knowledge and information amongst team members across various departments for effective decision making and collaboration. The knowledge base should facilitate this process by breaking down organizational silos and allow smooth flow of cross-departmental information sharing. As your company grows, it’s obvious that your content production will increase with it. An effective knowledge base must be able to support a large number of users and huge databases. It should be flexible enough to grow with your growing team and support a large number of new hires and subsequently, more content. Even though an internal knowledge base should generally be company-wide, there may be certain topics or content where you want to invoke user access and permissions (ex: making some content “view only”). An internal knowledge base must support effective user management. You should be able to manage user roles and permission levels that work for your organizational structure. Features like password protection, document tracking, file access restrictions, etc. are important to keep vital organizational data safe and secure. Does any tool on the market has all these features? 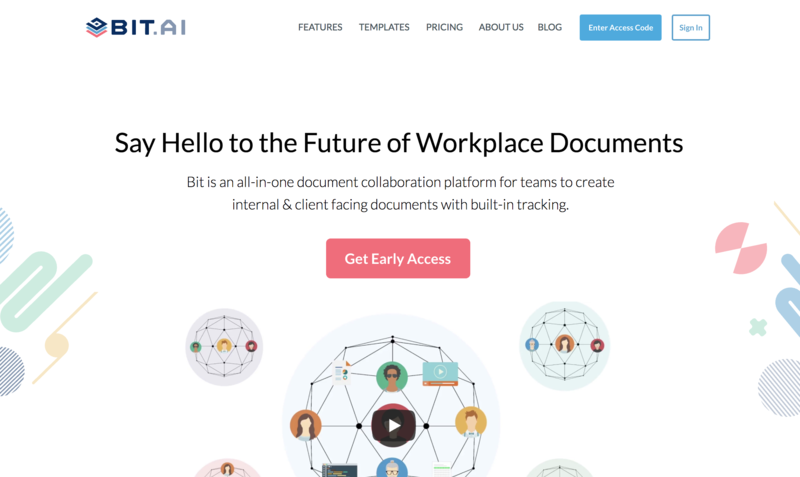 Bit.ai is a new-age document management and collaboration tool that helps teams to collaborate, share, track and manage all company knowledge in one place. It’s the perfect tool to create internal as well as external knowledge bases. Multiple people can simultaneously collaborate on a Bit smart document in real-time. It’s a wonderful way to create an internal knowledge base for your company by working simultaneously with your peers and superiors. Thanks to its smart editor, Bit makes the process of documentation and content creation quick and easy. Bit has a Content Library that automatically saves the images, files, and digital content you add to your documents so that you can access and reuse them easily. Smart workspaces are created around projects, teams, departments, and clients to keep your documents, data, and information organized. Workspaces make it easy to collaborate and ensure that the right team members have access to the right documents at the right time. They are fluid so your information can move through your organization’s workflows. Bit documents also support smart search, which allows anyone to search and find any files, images, documents etc quickly and easily across all of their workspaces. With the ability to effectively label content, users can search their digital assets using keyword, titles, descriptions, or tags. They can even search files based on its source. (i.e., YouTube). Bit allows users to manage permissions and information access that suits your organizational needs. It supports features like document tracking, password protection, file access restrictions etc that help keep your important company information safe. Bit provides a common workplace for knowledge workers and experienced executives to collaborate with employees, share their knowledge, brainstorm ideas, store digital assets, and innovate together. The best part is that this knowledge is safely secured in your workspaces and can be shared (or kept private) with anyone in your organization! Creating a competent internal knowledge base not only helps employees to stay up-to-date with organizational know-how, but also acts as a help center for your customers. With employees spending valuable time looking for information, an internal knowledge base acts as the teacher, always looking to solve any doubts and queries. So what are you waiting for? Stop the shoulder tapping and start building an internal knowledge base today!